Eddie Edwards: [They are taking gear from the lost and found room] Peary, is this not theft? Bronson Peary: It's the Lost and Found, man. Come on. Some guy dropoped 10 bucks on the street and you were to pick it up, would that be theft? Bronson Peary: What if he didn't know it was missing? Eddie Edwards: Then I'd give it to charity of something. 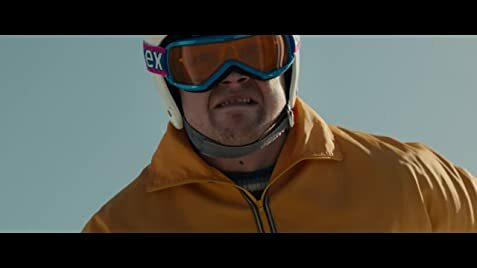 Bronson Peary: Eddie, you are a charity. Courtesy of Virgin EMI Records Ltd. 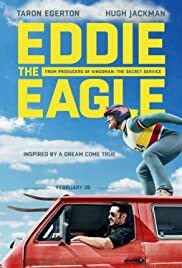 I remember Eddie the Eagle as a joke, a laughing stock, incessantly pilloried by the gutter press and sneered-at by the mainstream media alike. This film made me realise just how wrong I was. Those shots peering down from the top of the ramp at the tiny people in the distance barely hint at the terror, standing up there and knowing that when you set off, there is only one way down. They don't so much fall, as plummet. I enjoyed the humour and the music, but most of all the story ... just ... worked. I know it's dramatised, it's not a documentary. Doesn't matter. It was something unique, truly special. And the film captures the essence of Eddie's '15 minutes of fame' in a remarkably positive and upbeat way. A true Olympian.